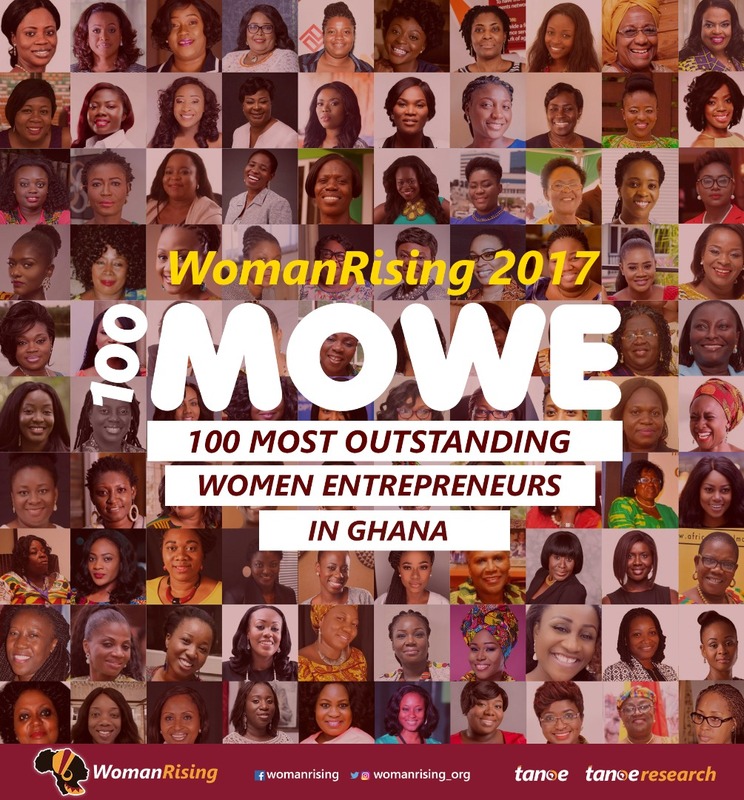 The African Network of Entrepreneurs (TANOE), through its flagship network, WomanRising has announced its 2017 WomanRising 100 Most Outstanding Women Entrepreneurs (100 MOWE) List. The list which features Ghanaian women entrepreneurs was compiled by TANOE Research and follows TANOE and WomanRising’s work in promoting achievements and exceptional milestones by women in Ghana and Africa. The list, launched in 2016, was established to inspire and empower more women to aspire and pursue entrepreneurship aimed at reducing unemployment and contributing to the immense growth of the economy. The 100 MOWE list captures women entrepreneurs from various sectors including but not limited to Technology, Education, Food Processing, Health, Real Estate, Media, Fashion, Beauty & Cosmetics, Construction, Agriculture & Agribusiness and Consulting. Out of the 100 honourees; Dr. Mrs. Ellen Hagan; CEO of L’aine Services and Mrs. Abena B. Bridigi; CEO of Nimed Capital have also been announced as 2017 WomanRising Woman Entrepreneur of the Year and Emerging Woman Entrepreneur of the year respectively. According to Ekow Mensah, CEO of TANOE and founder of WomanRising, the list was established to honour, celebrate and generate public recognition of achievements and contributions of the most inspiring and influential Ghanaian women in business. Other annual initiatives run by WomanRising include; WomanRising Conference on Global Business Leadership, Women CEOs Summit, WR Clique, 100 Most Influential Ghanaian Women, I Am a WomanRising Conference, International Women’s Day Conference, and Top 60 Corporate Women Leaders in Ghana.